So I finally read the final chapter in the Dune saga, brought to you by Kevin J Anderson and Brian Herbert. A more clumsy work I have never read. 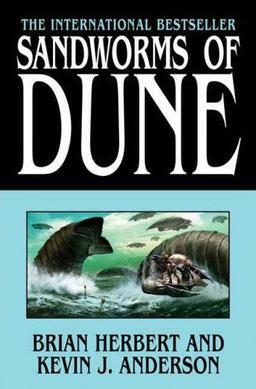 If you read the Dune books and wondered what ever happened after Duncan Idaho and his no-ship fled the old man and old woman, or who the great Enemy is, you probably wanted to read "Hunters of Dune" and its sequel, Sandworms of Dune. Let me tell you right now: you are better off not knowing. Because no matter what grandiose vision you had for Kralizec (the final battle for the fate of humanity against the great Enemy), you will be disappointed. First off, the writing in the book is even less subtle than Hunters of Dune, with several scenes put in place seemingly for the sole purpose of spelling out what was blindingly obvious already. Then we have the completly boring and unrealistic battle in the lair of the Enemy. (I'm trying to keep this spoiler free for those of you who plan to disregard my advice and read it anyway). If you know already who the enemy is, you're probably wondering what purpose this enemy would have with a lair, and also wondering how you fight said enemy once you are in his lair. Well, Kevin and Brian don't disappoint, in that they painstakingly spell out every single step of this improbable conflict. The book is full of side plots that go nowhere and people behaving irrationally, much like a cheap action movie villain, who wants to take over the world but can't just kill the hero outright, he has to contrive some elaborate trap which ultimately fails. Then there is the question of the Enemy itself, which to me feels like a cheap way for Brian and Kevin to tie in their prequel work with the original series. I'm still wondering if this is anything like what Frank Herbert had in mind. At least the mystery of why Duncan Idaho was resurrected so many times was revealed. But if you thought there was some deep meaning, it turns out there wasn't. So don't get your hopes up. Maybe after I feel ok about revealing spoilers I'll go into detail about what was really wrong with this book, including how I think it could have been made 10x better. But basically, considering the nature of the Enemy and the characters involved, a better author could have written a gripping tale that incorporated the best themes of sci-fi from the last few decades and the ideas from the Dune series. Instead we got lousy action scenes, bad dialogue, and a terrible plot. But at least now I know how the story ends and I don't have to read any more of these books. Now when I finish reading Terry Goodkind's series I can put all the bad authors out of my reading list. Some people are just too stupid to use elevators. The other day I was at a mall waiting to use an elevator. It was a long wait because there were several people ahead of me and only one elevator. An elderly couple (the man using a walker) was waiting, along with two mothers, each with a stroller and a bunch of walking kids. Unfortunately the old gentleman hadn't pressed the button (his eyesight must not have been good, he was pressing the keyhole under the button) so we missed one one elevator. But once he pressed the button that's when the shenanigans began. First, two women appeared out of nowhere and went up ahead of everyone to stand right by the doors. They clearly jumped the queue (well... flock) in the most inconsiderate way possible. They weren't even carrying anything, let alone pushing a stroller (as I was) or using a walker or cane. Yet somehow they felt they should get on first. Maybe they were VIPs or gods or something, or maybe they had a "Get on the Elevator First" pass-card. Then the doors opened and people started to get off. This, however, conflicted with the goals of the two mothers I mentioned (they were travelling together), who had herded their strollers and children into a half-circle wall, thus closing all gaps and preventing anyone from exiting the elevator. I guess they were trying to get on, but simple common sense would tell you that you can't get on a full elevator if nobody gets off. Not only that, but their aggressive tactics didn't stop the two inconsiderate women from getting on first anyway. So the elevator was crowded: the older couple, the two VIPs, and then the first mother and her children all got on, but there was no room for anyone else. Ok, no problem, we'll take the next one. Except the one mother who made it on the elevator didn't get off at her stop; she rode the elevator all the way to the bottom, then back to the top, so she could be reunited with her friend! This means that when the elevator finally arrived at my floor again there STILL wasn't room for me to get on, as the woman's friend got on and that left no room for me, my stroller, and my wife. I tried asking the woman why she didn't get off the elevator but she just stared blankly at me while the doors closed. Maybe she didn't even know. People who think they're more important than everyone don't surprise me anymore (though I do hate them) but I am always amazed at how few people grasp the concept of "You can't get on without letting others get off first".